Since many native foods are scarce this time of year, bird feeders can be quite busy. Birds, such as cardinals, finches, chickadees, titmice and sparrows, prefer black-oil sunflower seeds (hulled seeds cause less mess) in hanging feeders. However, if you happen to grow plants like eastern redcedar and winterberry (both are natives with high wildlife value) that still hold their winter fruit, then you may find a flock of colorful Bombycilla cedrorum (cedar waxwings) stopping by for a snack. 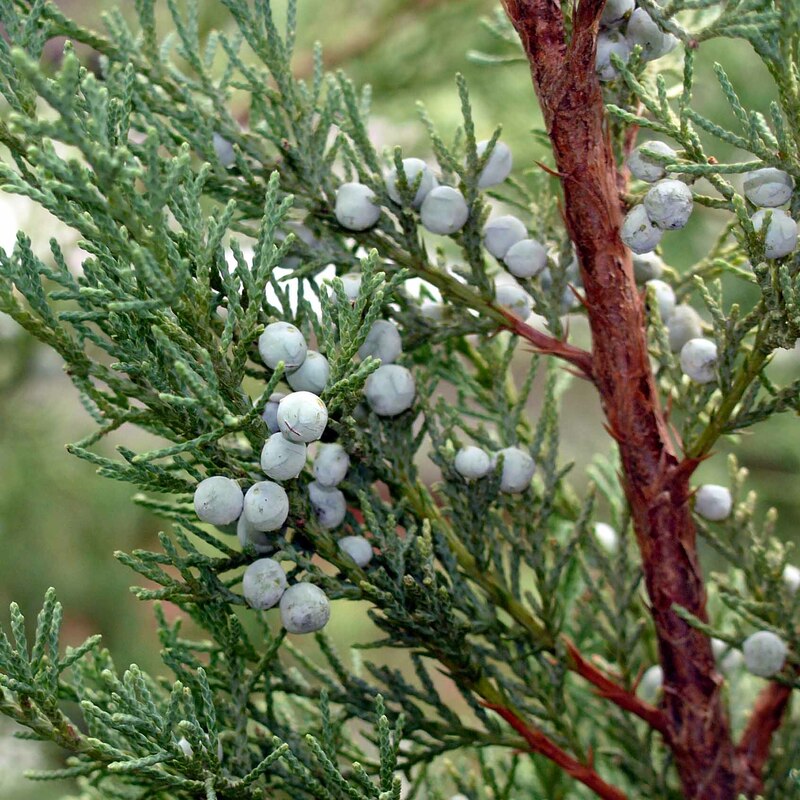 Juniperus virginiana (eastern redcedar) can grow up to 40’ tall but is often maintained as a shrub. It offers nesting sites for birds like robins and juncos and food for both birds and small mammals. Photo copyright Mary Free. Unlike most birds, cedar waxwings feed almost exclusively on fruit, especially in the winter. In fact the first part of their common name derives from the cedar fruit of which they are so fond. In the spring and summer, they eat sap and insects as well. “To eat like a bird” is not a term that would apply to cedar waxwings. Instead they have a tendency to overeat. They swallow berries whole and often gorge themselves. 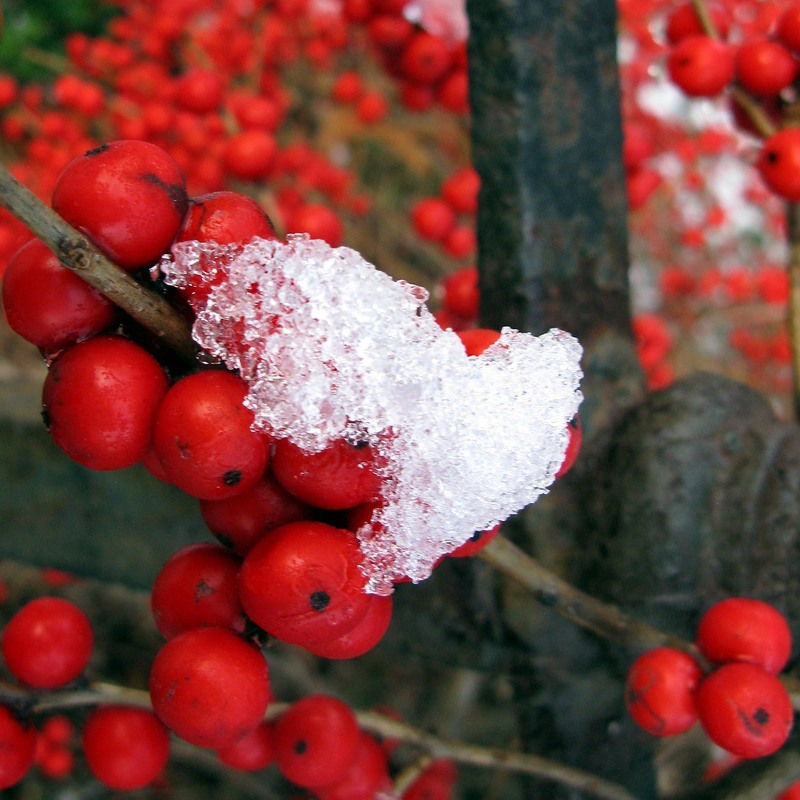 A flock will descend on shrubs laden with fruit, strip them bare and then continue on their way. Some birds that have devoured old and fermented fruit have been known to succumb to alcohol poisoning. That is what may have happened to the dazed cedar waxwing pictured below. It also may have flown into a window. Fortunately it recovered and eventually flew away. 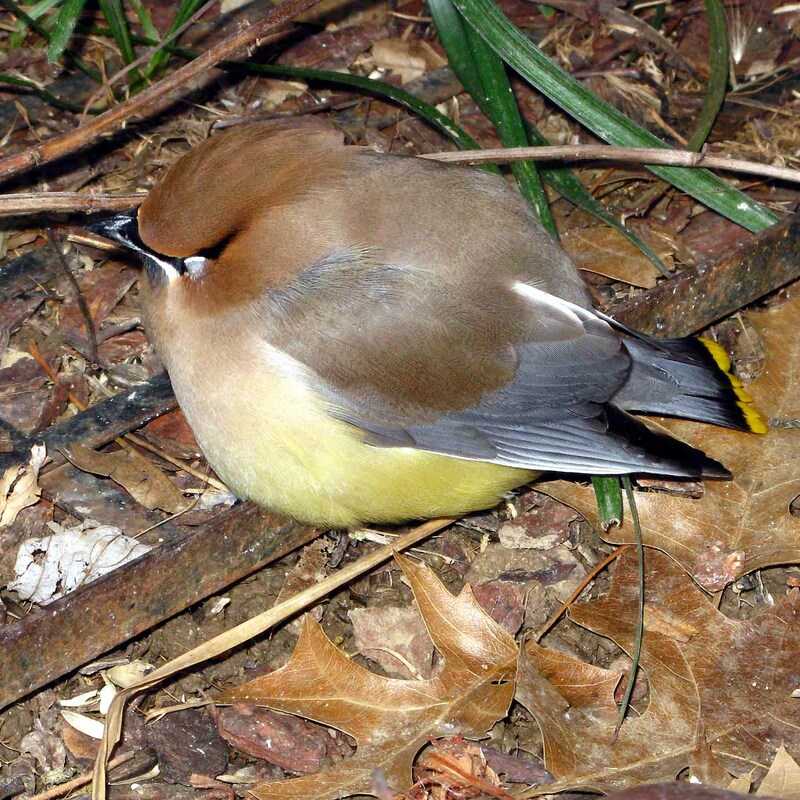 Was this dazed cedar waxwing inebriated and/or concussed? Photo copyright Bruce Roberts. Did you know that an estimated 100 million to 1 billion birds die annually by window strikes (Sibley Guides 2010)? Recommendations to reduce window reflection, and thus help prevent collisions, include using: outside screens (most effective); window dividers/muntins/grids; stained glass windows; or ribbons, string, tape, feathers or the like that hang in a row on the outside of a window. Apparently, putting decals inside of windows has not proven to be an effective deterrent. As high as those mortality estimates are though, a recent study by Loss, et. al. (2013) shows that in the contiguous United States, free-ranging domestic cats kill between 1.4 and 3.7 billion birds annually. Unfortunately, native birds are more likely to be victims than non-natives. Although about 69% of this mortality is due to un-owned cats, if you are a cat owner, you can help by keeping your cat indoors and not letting it roam outside unsupervised. With the threat that windows and cats pose to birds, you should take care where you hang your bird feeders and locate your birdbaths. Feeders should be at least 6 feet above the ground and close enough (about 15 feet) to shrubs and evergreens so that birds can escape predators but not close enough for predators like cats to hide and pounce. Feeders should also be far enough away from windows to prevent collisions. Place birdbaths in a shady, open space near shrubs or low trees so that birds feel safe and can easily elude predators. Do not have vegetation around the birdbath that could provide a hiding place for cats. When you invite birds to eat or drink in your yard, you want to ensure that you are providing a safe environment for them. Be a considerate host, then sit back and enjoy your visitors.